Uses: Utility: eggs and meat. Eggs: 160 to 200+ Eggs. 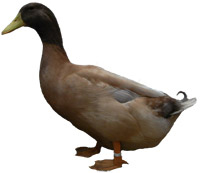 Weight: Drake: 2.2 – 3.4 Kg, Duck: 2.2 – 3.2 Kg. Colours: Buff (other colours extremely rare or extinct). Useful to Know: Three colour variations will hatch due to blue dilution gene. Photo: A Buff Orpington Drake. The Orpington duck was created by William Cook of Orpington, Kent around 1890 as a dual purpose utility bird. It is thought to have been developed from Aylesbury, Rouen, Cayuga and Indian Runner ducks. Mr Cook famously produced the Orpington Chicken at around the same time. The Buff Orpington duck was a result of the vogue for buff-coloured poultry, and was first shown in England in 1907. It was standardised in Great Britain in 1910, followed by the Blue Orpington in 1926. In America only Buff was standardised, and the breed entered the American Standard of Perfection in 1914 as ‘Buff Ducks.’ It is very unusual for a colour to be used as the sole name for a breed, and they are now referred to simply as ‘Buffs’ in the USA, where they never achieved the commercial popularity of the Khaki Campbell or Pekin. The Orpington duck is a very good layer, capable of 200 or more large white eggs in a year. Being heavier than other top laying breeds, it can also produce a useful table bird. The buff colouring stays cleaner than that of white ducks, yet the pinfeathers aren’t obvious when the bird is prepared for the table. The Buff Orpington is also an attractive and popular exhibition breed. The females occasionally go broody, and these ducks are fairly easy to breed apart from the colour considerations (see below). The body is long, broad and deep with carriage about 20 degrees above the horizontal– too upright a stance is regarded as a fault. The bill is yellow with a dark bean at the tip. It should be straight and set fairly high on the head. Eyes are brown. Legs are strong and orange/red in colour. The buff has a reddish undertone, but ideally the colour is even all over without grey, white or pencilled feathers, and with no white neck ring. The drake has a glossy brown head and upper neck – this colour should finish in a sharp line all around the neck. There should be no trace of green, and a minimum of blue on the rump. As with other buff-coloured poultry, plumage can fade in sunlight. The Buff Orpington is an unstable colour due to a blue dilution gene. This means that from the offspring, three colour variations will appear: Buff, Blond and Brown. Only Buff is recognised as a standard colour. In the Blond variation the adults are pale buff, and males have a grey/brown head. Brown females have light-brown pencilling; males have brown heads and rumps. 1. Buff – Soft olive yellow down. 2. Blond – Pale yellow down with yellow bill. 3. Brown – Brownish down with dark brown bill and legs. There was also a Blue Orpington Duck, which is now very rare or possibly no longer in existence. It was reputedly larger than the Buff, and a deep blue all over with a small heart-shaped white patch on the breast; the drake’s head and neck being a much darker blue. Black, Chocolate and White Orpingtons followed in the early part of the twentieth century, but these colours were never standardised. Both Black and Chocolate had the white bib on the breast, and the Black was around same size as the Blue Orpington. The Chocolate variety was smaller, although slightly larger than the Buff, and equaling it for laying ability. It is unlikely that any of these colours are still around today, and even if they were it would be very difficult to be sure of their authenticity. Trio of Buff Orpington Ducks. Head of a Buff Orpington Duck owned by Graham Hicks. Photo courtesy of Rupert Stephenson. Buff Orpington Duck owned by Team Wakeham. Photo courtesy of Rupert Stephenson. Buff Orpington Duck owned by Graham Hicks. Photo courtesy of Rupert Stephenson. Buff Orpington Duck taken between 1920-1940. Photo courtesy of the Rice Collection. Buff Orpington Drake owned by F. and C. Jones. Photo courtesy of Rupert Stephenson. Buff Orpington Drake taken between 1920-1940. Photo courtesy of the Rice Collection. Brown and Buff Orpington Drakes. Photo courtesy of the British Waterfowl Association. Please leave a comment below if you can provide further information or have a question about Orpington Ducks.